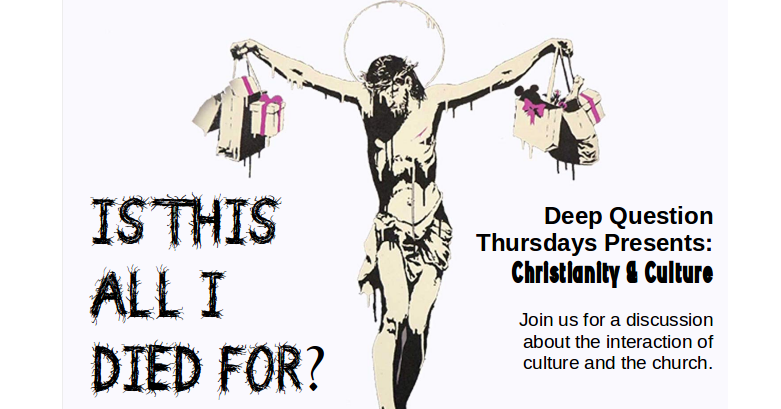 Join us for a discussion about the interaction of culture and the church. Is this All I died For? How should Christians interact with culture? Should we flee from popular culture? Critique culture? Consume culture? Create culture? How do we deal with tradition and older Christian cultures? Do we cling to them, abandon them, or reform them? Culture is cultivation. Culture is not simply the creation of useful tools or attractive and entertaining distractions, its the making of meaningful artifacts that shape our world and alter its course. Biblically, we see that this meaning making process is an implicit trait of the human nature. Humans were created in the image of God; just like the original Creator, we were made to be creators. To make meaning of our world. Animals may create, ants make anthills with tunnels and chambers hidden for miles underground, bees make honeycombs, and apes make simple tools, but none of these as far as we know, are meaning making. They are simply utilitarian. We have no indication that the rest of creation wonders about the world, trying to make sense of the world around them or find meaning in the structures that came before them. They do not appear to innovate; rather, as beautiful as their creations may be, they are made from instinct and need, not from a desire to find meaning or to re-shape the world that they were given.